Though I’m not sure this is the exciting new Blizzard publication we were all waiting for — more Overwatch please — we do love bringing WoW cooking recipes into real life. So a cookbook? Why not! World of Warcraft: The Official Cookbook is written by Chelsea Monroe-Cassel, who’s written a similar book for Game of Thrones (A Feast of Ice and Fire if you’re in need of more fictional foodstuffs) — and it’s now available for pre-order on Amazon. Inside you’ll find recipes covering both the Alliance and Horde with Ironforge Rations, Sweet Potato Bread, Dragonbreath Chili, Heathglen Ambrosia, Cherry Grog, Rylak Claws (made of pastry so you don’t have to find any Rylaks), Honey-Spiced Lichen, and more. 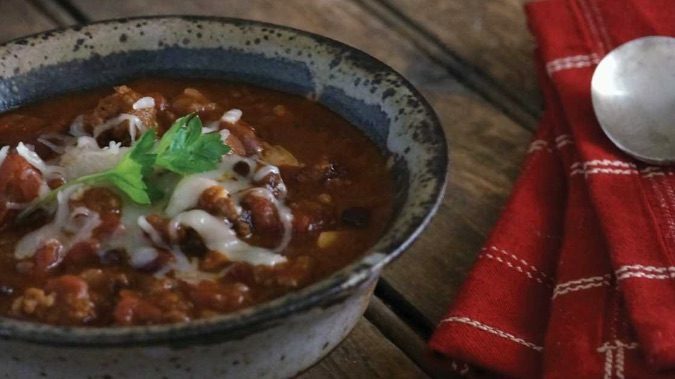 Of course the question is… are these fictional recipes actually going to be good to eat? We’re certainly curious. One of the ingredients for Ironforge Rations is canned haggis, which does raise some questions. (Firstly, is canned haggis a thing that actually exists? And if so, why?) 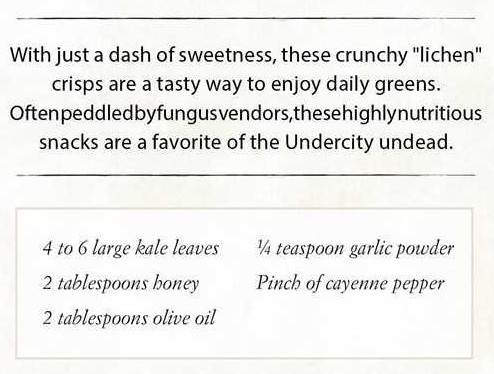 Then the Honey-Spiced Lichen is actually kale chips, which are not to everyone’s taste. But we are only seeing a small sample of the book and the Rylak Claws, while not made of actual Rylak, do look delicious. Food aside, our real qualm with this book is the text formatting. Above you’ll see the description of the Honey-Spiced Lichen recipe and you may notice it includes the… word?… “Oftenpeddledbyfungusvendors,thesehighlynutritious.” Of the seven recipes previewed, five include sentences of this nature. We only hope a copywriter attacks this book with a knife before it hits store shelves in October, because even reading this preview brings on a headache. If you’re all in on Warcraft-inspired cuisine despite the haggis, you can pre-order the World of Warcraft cookbook now on Amazon. It’s due out on October 18, just in time for your Warcraft-inspired Halloween party.